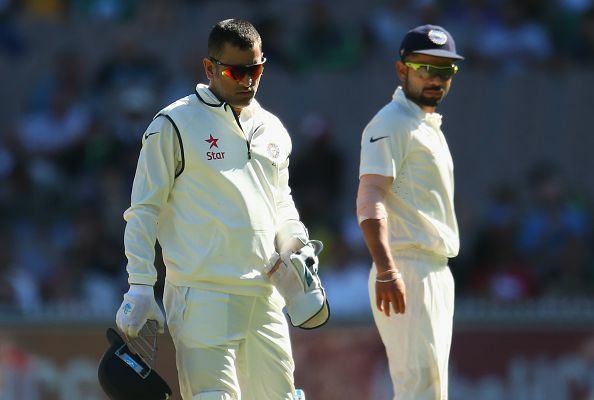 Virat Kohli has admitted that there were many in the media who tried to create rifts and differences between him and MS Dhoni by planting false stories, but neither has paid any heed towards them. The skipper also considers himself lucky to have Dhoni by his side in his early years of captaincy. The amazing camaraderie that India’s former skipper MS Dhoni and current captain Virat Kohli share is quite evident during games. They are both seen communicating, continuously, with each other with Dhoni providing all his expertise to the young captain as and when needed. However, that hasn’t stopped the media from churning out stories of differences and fall-outs between them and Kohli cleared the air in his latest appearance during an episode of web-series 'Breakfast with Champions'. “A lot of people try to plug in stories of a rift between us. The best part is neither he reads those articles nor do I. And when the people see us together, they wonder 'wasn't there a rift between the two'. We laugh amongst ourselves and say we didn't know there was one," he said. The young captain has taken India to new heights now with the side contending for top positions in both ODI and T20I rankings, after becoming number one in Tests. And he hasn’t shied away from acknowledging Dhoni’s brilliant presence of mind on the field in achieving all this. “I don't think I have ever come across a better cricketing brain just in terms of planning, knowing what's happening in the game and what can be done. Obviously, I go by my instincts but whenever I ask him anything 8 or 9 out of 10 times what he says, works,” he said. Virat Kohli even went on to claim that he has blind trust in Dhoni and considers himself lucky to have a friend like him by his side during the early years of his captaincy. “Our friendship has only grown over the years. The transition happened so smoothly. No one on the field (players) felt that there has been a change… I am happy that he is there by my side during my initial years of captaincy. I am lucky to have him," Kohli added. “MS and I have a great understanding. While running between the wickets, if he says two, I just close my eyes and run because I know that his judgement is so correct, I will make it."